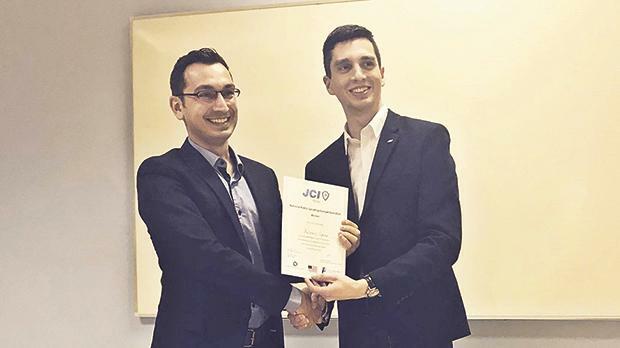 Dr Anthony Galea (left) receiving the winner’s certificate from JCI Malta deputy president Christoph Schwaiger. Dr Anthony Galea from the Department of Geosciences’s Physical Oceanography Research Group at the University of Malta’s Faculty of Science, won this year’s National Public Speaking Competition. This year’s topic was ‘The best way to predict the future is to invent it’ and Dr Galea impressed the panel of judges with his five-minute speech entitled ‘Inventing the future through science’, in which he integrated the Bernoulli principle. The finalists also had to deliver a three-minute impromptu speech in front of the audience. Dr Galea will now represent Malta in the 2018 Junior Chamber International (JCI) European conference to be held in Riga Latvia, in June. The local competition was organised by the JCI Malta in collaboration with the National Youth Council and the English-Speaking Union of Malta (ESU Malta).